Highest Quality Material - We use high quality stainless steel with an antique finish as opposed to zinc alloy used by competitors. Improve Taste With Ease - Our simple pourer & aerator combination allows you to enjoy your wine instantly without having to decant or "let it breathe". Just pop it into the bottle and enjoy! 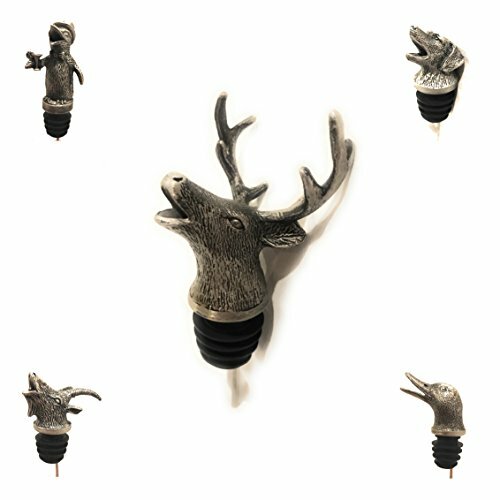 Perfect Party Gift - Be unique and add one of these wild little guys along with a nice bottle of wine to stand out from the pack. Also makes for a great grab-bag gift! Fun and Safe - Show your wild side. Great conversation starter and made with the highest quality FDA approved materials. Compatibility - Our pourers are equipped with specially designed silicon stoppers that fits snugly into almost any wine or liquor bottle. These animals play nicely with everyone! If you have any questions about this product by The Wildly Refined Collection, contact us by completing and submitting the form below. If you are looking for a specif part number, please include it with your message.